The Great Loop is the continuous waterway that encompasses the eastern portion of North America including the Atlantic and Gulf Intracoastal Waterways, the Great Lakes, the Canadian Heritage Canals, and the inland rivers of America's heartland. Our members range from experienced Loop cruisers to boaters in the midst of Looping; those planning on one day cruising the Great Loop to those simply exhilarated by the process of learning about the journey. Every level of interest is welcome, no restrictions or limitations! Whether you're young or just young at heart, still working or retired, ready to travel full time or only every-so-often; whether you've got a powerboat, sailboat, trawler, rowboat or no boat; whether you are doing the Great Loop or dreaming, you'll fit right in, come aboard! The organization began with a simple plan. Form a Great Loop Cruiser organization, distribute a newsletter, mine the minds of the members, include their stories, sell some books. That was about it. 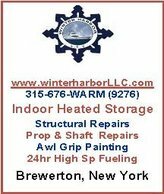 At Ron and Eva Stob's first Trawler Fest in Melbourne, Fla., in 1999, where they were presenting a seminar, they were given a booth to sell their new book, "Honey, Let's Get a Boat...", and on the table placed a sign-up sheet for those who wanted to be part of a new organization, America's Great Loop Cruisers' Association. The dues would be $18 a year for a bi-monthly (six per year) newsletter focused on the trip: boats to use, where to stop along the way and miscellaneous topics yet to be developed. 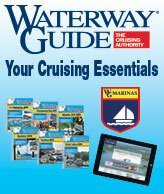 They sent information to various boating publications about the new organization and developed a website. The post office box began to fill with applications. In one period they received as many as 40 applications a day. There was a gold seam somewhere out there in the deep and they had struck it. They never intended to foster, attend or manage Rendezvous, but when Trawler Fest canceled their event in Grand Haven, Mich., in August 2001, they went there anyway and met the Loopers coming down Lake Michigan. The city was open to their presence and promised to make room for a few boats that might make the stop-over. Twenty boats and seventy members showed up. They did a one-day get-together with a presentation on cruising the rivers, open forum discussion, Getting to Know You game, Looper Crawl and a potluck dinner. The Rendezvous were organized, two or three a year, by the members at first, then by the Stobs. Meeting places needed to have a marina and a lodge that could also accommodate seminars and a venue for food, fun and games. Their members wanted a special burgee that showed their "Graduate" status if they completed the Loop - the gold burgee. Those who completed the Loop a second time got the MasterLOOPerate Award. The Stob's house began to resemble a small Amazon warehouse. They even had an AGLCA clock. "At this point, we were up to our eyeballs in paraphernalia, emails and phone calls, shipping, and planning the next event," Eva said. At the Joe Wheeler Rendezvous in October, 2006, they had over 250 attendees and 70 boats and a power outage in the middle of dinner. The email coordinator, Steve Kromer, always had many ideas for improving the organization. In December 2006 the Stobs met with Steve and wife Janice in Charleston and talked about new services (many conceived by Steve) and their sputtering energy. Steve and Janice said they would like to take over AGLCA, given their existing business operations and staff that could handle a project like this. "Call it serendipity, kismet, whatever, but Janice and I just happened to be in downtown Charleston celebrating Janice's birthday, when Ron and Eva visited to scout locations for a Rendezvous. We had become friendly through my involvement in the group, and they called us up and asked us to dinner," Steve explained. During dinner, the conversation turned to managing AGLCA and how Ron was, "getting older and didn't want to do it anymore." The Stobs confessed to being ready to retire and turn the organization over to someone else. Once that statement was on the table, the meal became a planning session for how to transition ownership from the Stob family to the Kromer family, and by April of 2007, the deal was done. Janice became the Executive Director, a role she later handed over to Kim Russo. Janice stepped into the role of Member Services Coordinator, which she held until a few years ago. She is still involved with AGLCA, but has turned the reins over to other staff members. Steve handles the technical side of things and recently developed the Interactive Great Loop map for the website. Kim Russo is the Executive Director. She has a hand in all aspects of the organization. JoAnn Smith is AGLCA's Sponsor Sales & Service Coordinator. JoAnn works with the sponsors to make sure they are up to date with our marketing efforts and are getting the most out of their sponsorships. JoAnn is a native New Yorker who grew up around the water. She's become so enamored of the Loopers and their journey that she's convinced her husband and college roommate's family to do the Loop with her some day! Julie Shea is AGLCA's Member Services Coordinator. Julie works to assist members with any questions or concerns they have regarding their membership, website processes, and purchases for products and event registrations. Julie is a Wisconsin native and spent many summers out on the boat on the inland lakes with her family. She loves talking with our members and hearing their stories - each Looper's journey is equally amazing! Since Steve and Janice took over America's Great Loop Cruisers' Association from Ron and Eva Stob, they have invited a group of respected Loopers to participate in an Advisory Council and offer input on questions and situations that come up throughout the year. These dedicated individuals provide advice on an on-going basis and most often come to Rendezvous as volunteers to help with the event. The AGLCA Home Port Crew turns to them often when we'd like opinions from Loopers that are not on our staff.